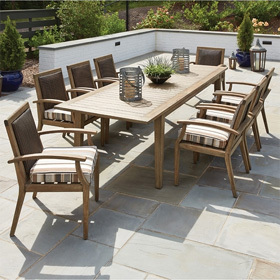 Offering a sampler of the array of cushioned seating options available from Woodard's Andover Collection, this large-scale patio arrangement provides superb comfort for four to five individuals. This ultra comfortable set is completed by three end tables with appealingly textured thatch tops. Loveseat 75.5"W x 32.5"D x 32.5"H 65 lbs. Coffee Table 36"Rd x 19.5"H 51 lbs.